Continued from last week. This was the weekend of my wedding, so I hope I can be forgiven for stretching a Victorian segment over two Sundays. I did some nice sound effect fonts on these pages. 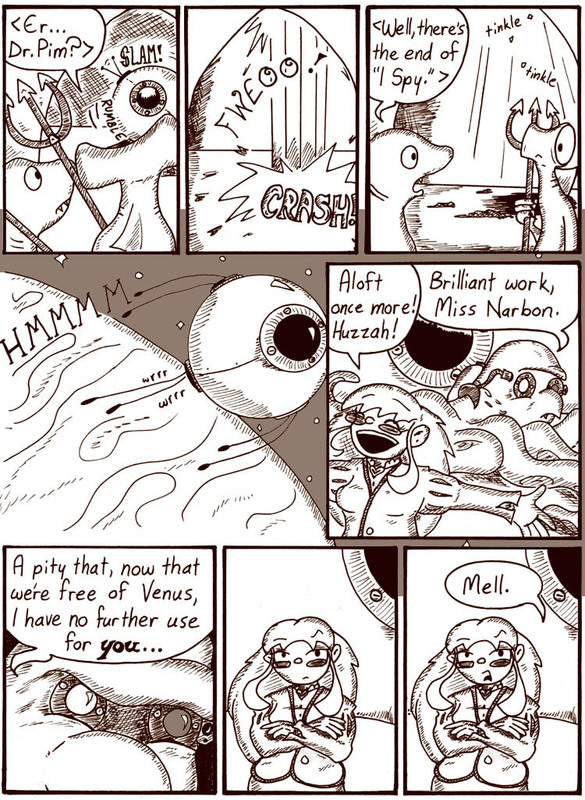 I drew too many tiny old-timey lines all over Helen in the last two panels. That still bugs me. Mell never approves of Helen’s boyfriends. I think Helen and Mell had previously indicated to Dave that they got rid of his body after putting his brain in the Hapax Legomenon. Now it turns out they had it stashed away somewhere. Like I’ve said before, I made this whole Victorian serial up as I went along. I really like Dr. Pim. He’s probably my favorite thing in the Victorian story. 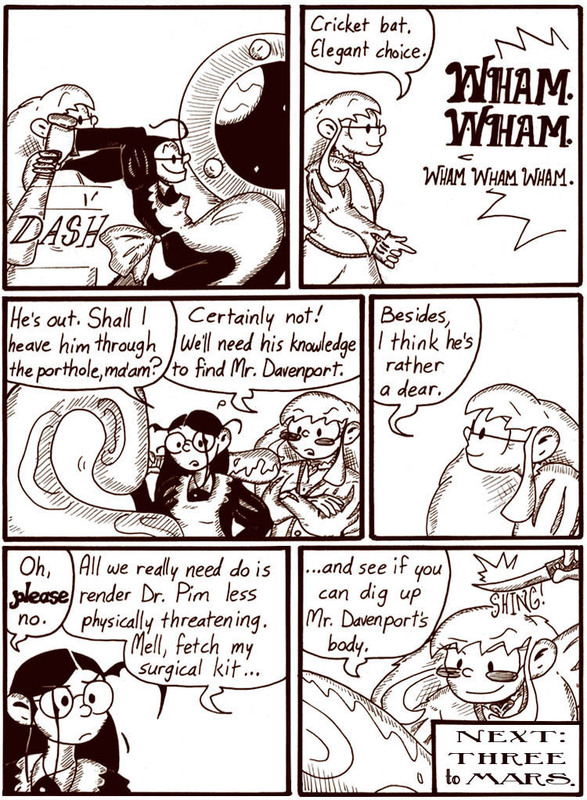 Not that there isn’t other good stuff in here, but Dr. Pim is my favorite. Right through the roof they launch with ease! Sailing away on the solar breeze! One is a ce-pha-lo-pod, quite fat! One is a madwoman, lost her hat! One is a thug with a cricket bat! Fresh from the realm of Queen Victoria! If you would live, then you can’t ignore her! I’m disturbed by the size of crickets Mell apparently encounters, given the size of that bat. Huh, Mell is quite clearly wielding a Rounders bat, not a Cricket bat. Cricket bats are longer (in my experience, it’s easy to lean on if you’re feeling lazy), and have a distinctive flat side as well as a v shaded ridge on the other. Actually, it is a cricket bat; it’s just rounded by the Fitz-Gerald contraction. Did you mean Lorentz-Fitzgerald contraction? And it looked more like a baseball bat to me, although it could be a rounders bat.